These salmon burgers are THE YUMMIEST! 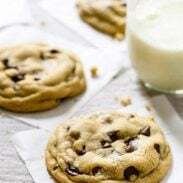 and made with just five ingredients. The best for a quick + easy high protein lunch or dinner. For the salmon, you could use leftover steamed, poached, grilled, baked, whatever kinda salmon. If you don’t have any cooked salmon handy, use canned salmon! That’s what I usually do. I would recommend looking for a brand of canned salmon that is caught in the US. I really, really like Wild Planet for quality canned salmon. You can read more about their sourcing/fishing methods here. Not sure one can find sustainable canned salmon in Denmark, but I will definitively go look for it. If you take suggestions for posts, would you maybe consider making a ‘things always in my pantry’ post. I recently moved alone, and I am not sure how to stock my kitchen. Kind regards from Denmark, and happy belated birthday to Afton! Ditto! Love the idea of a pantry post! I’ll be looking for sustainable salmon in Germany, too. Fingers crossed! Ugh, I really hate canned tuna, but maaaaybe you’ve convinced me to try canned salmon? Or maybe I’ll just buy fresh 😉. Amyway, thanks for the recipe! yesss pantry friendly meals are the best and im totally digging this combo! These look AMAZING! I really love your photography. I use canned salmon a lot and love it:) I don’t think it’s gross at all. I always have canned fish in my cupboard for back pocket recipes. It’s a healthy hack. 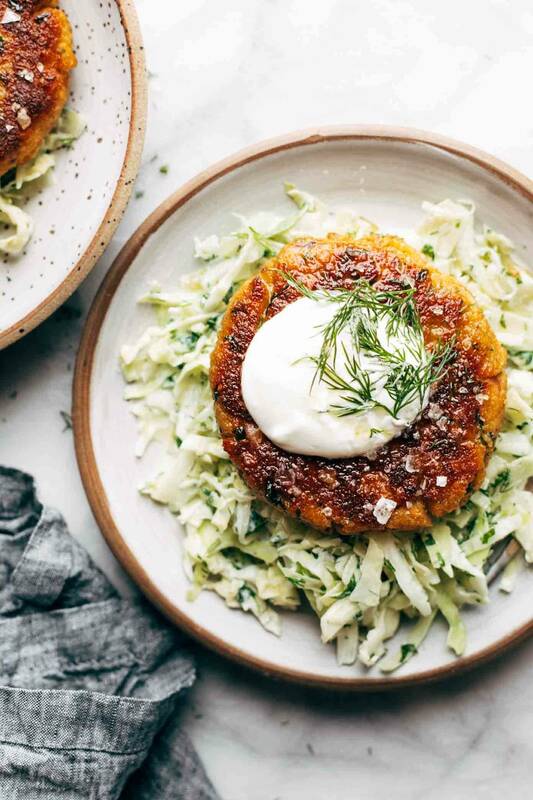 I am such a fan of salmon burgers… and dill… so am loving this recipe! Thanks Lindsay! Thank you SO much for trying out a GF option for us. I think my tastebuds and yours are related. I love pretty much every recipe you have come up with and it’s always a joy when I don’t have to mess around with them to make them GF. So excited about the salmon burger recipe with slaw. No need for canned salmon from the store when you live in Alaska and have a fabulous son in law who keeps you supplied with salmon! Yippee! Thank you for the recommendation on a type of canned salmon that isn’t awful. The grayish, slimy, nasty situation going on in most canned salmon is totally revolting to me. I’ve never actually been to Whole Foods (gasp! ), but I would venture there just for canned salmon that was delicious. This looks delish and quick and easy! I’ve been reluctant to try canned fish other than tuna but you’ve convinced me to give it a try. It does make sense to have it in the pantry. We love salmon burgers at our house, so I don’t think they are weird. 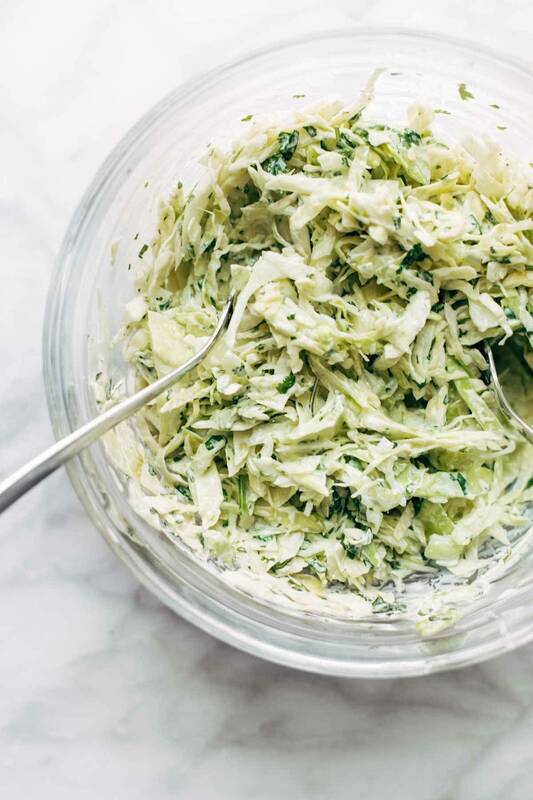 🙂 I have never served them with slaw, but I think it i s a great idea. Great recipe! One of my & my husband’s go to meals is similar to this – a salmon patty recipe (that includes some finely diced green bell pepper for extra crunch & nutrients) + braised red cabbage (only 5 ingredients: cabbage, butter, onion powder, apple cider vinegar, water). We get our canned salmon at Costco. So good! Are these based off of the Food Network salmon burgers that you posted about on Instagram awhile back? (http://www.foodnetwork.com/recipes/food-network-kitchen/salmon-burgers-with-green-apple-slaw-3894917). I saved that recipe because it looked good to me — I like that you cut the green apple (didn’t seem appealing to me, either). Would add a little tiny sugar or honey to the slaw to round it out. These sound really great. Thanks for the inspiration. I have one recipe that I grew up with that uses canned salmon. It’s essentially a salmon loaf, but my kids gobble it up. We will definitely try this, because I’d love to learn more things to make with canned salmon. And yes, it is gross picking out some of the bones, but so cheap, so healthy, so easy! Could these be baked in the oven instead of pan-fried? These actually sound really good. I love using slaw on burgers! 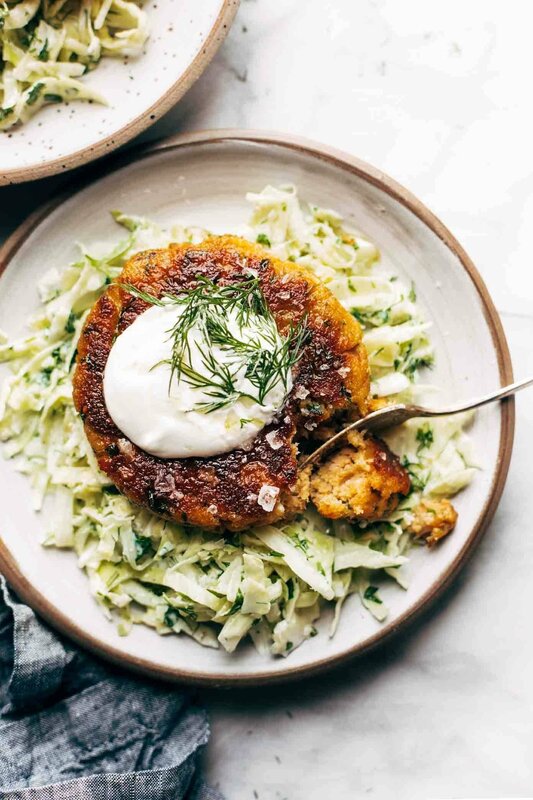 like a big crab cake, I like it and even without a bun (preferred anyway) thank you for this recipe and like the cabbage slaw too! Yum ! Will definitely give it a try this week ! Any dairy-free alternative for Greek Yogourt ? We don’t have any idea that come to mind – but you could maybe possible omit so the dressing is more like a vinaigrette? Coconut yogurt? You could also try soy sour cream if you’re not opposed to soy. For those who hate canned tuna, canned salmon is way better … especially cooked, I am SOOOO excited to try this recipe. Second the idea to make more “basic pantry” posts. I love everything Ive tried from you … thank you! This looks so good! I adore salmon. I’ll have to look for fresh, though, because we don’t have a Whole Foods by us and I really don’t need 12 cans of salmon delivered to my house. 😉 Sadly, I’m the only one in the house who will eat salmon, but I’ll just have to save this recipe for boys’ night out! Thanks for sharing! Love Salmon Burgers! They’re just to simple to make. I particularly like the slaw you’ve got to go with yours Lindsay.